The main foucus of my group is directed towards adaptation, response patterns and molecular reactions of animals towards stress factors of mostly anthropogenic origin, by also considering and including their ecological and ecotoxicological implications. We feel that in this concern there is a particular need of integrating fundamental and applied environmental research. The importance of resistance and detoxification meachanisms for microevolution in invertebrates. Development of molecular and biochemical biomarkers for monitoring pollutant exposure. Dallinger, Reinhard: Associate Editor und Reviewer - Journal of Experimental Zoology - Part A, 2012-01-01 - 2016-12-31. Dallinger, Reinhard: Mitglied des Editorial Board - Chemistry and Ecology, 2009-01-01 - 2016-12-31. Dallinger, Reinhard: Mitglied des Editorial Boards und Reviewer-Tätigkeit - Water, Air, and Soil Pollution, 2006-01-01 - 2016-12-31. 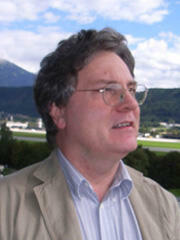 Dallinger, Reinhard: Associate Editor und Reviewer-Tätigkeit - Journal of Experimental Zoology - Part A, 2006-01-01 - 2010-12-31. In: Molecular Ecology 18/11, pp. 2426 - 2443. In: Journal of Experimental Zoology Part A: Ecological Genetics and Physiology 311A/10, pp. 776 - 786. In: ENVIRONMENTAL TOXICOLOGY AND CHEMISTRY 27/7, pp. 1533 - 1542. In: Molecular Phylogenetics and Evolution 48/3, pp. 825 - 837. In: Molecular Phylogenetics and Evolution 48/3, pp. 838 - 849. In: Science of the Total Environment 382/2-3, pp. 286 - 294. In: American Journal Of Physiology-Regulatory Integrative And Comparative Physiology 289/4, pp. 1185 - 1195. In: ENVIRONMENTAL TOXICOLOGY AND CHEMISTRY 23/3, pp. 648 - 655. In: ENVIRONMENTAL TOXICOLOGY AND CHEMISTRY 23/4, pp. 890 - 901. In: ENVIRONMENTAL TOXICOLOGY AND CHEMISTRY 23/4, pp. 902 - 910. In: ECOTOXICOLOGY 13, pp. 757 - 772. In: TOXICOLOGY 196/1-2, pp. 57 - 64. In: Journal of Experimental Zoology Part A: Ecological Genetics and Physiology 301A/1, pp. 75 - 84. In: Journal of Experimental Zoology 301A, pp. 75 - 84. In: COMPARATIVE BIOCHEMISTRY AND PHYSIOLOGY C-TOXICOLOGY & PHARMACOLOGY 138/1, pp. 45 - 52. In: ECOTOXICOLOGY 13/8, pp. 817 - 822. In: TOXICOLOGY AND APPLIED PHARMACOLOGY 190, pp. 25 - 36. In: TOXICOLOGY AND APPLIED PHARMACOLOGY 191, pp. 235 - 244. In: Molecular Phylogenetics and Evolution 24/1, pp. 26 - 34. In: European Journal of Biochemistry 268, p. 4126. In: CELLULAR AND MOLECULAR BIOLOGY 46, p. 331. In: NETHERLANDS JOURNAL OF ZOOLOGY 50/1, pp. 1 - 14. In: Protein Science 9, pp. 395 - 402. In: Protein Science 9/2, pp. 395 - 402. In: European Journal of Biochemistry 267, p. 573. In: MOLECULAR BIOLOGY AND EVOLUTION 16/7, pp. 967 - 974. In: Molecular Phylogenetics and Evolution 10/1, pp. 144 - 149. In: Molecular Phylogenetics and Evolution 10, pp. 144 - 149. In: Biochemical Journal 328, pp. 219 - 224. In: AQUATIC TOXICOLOGY 38/1-3, pp. 47 - 66. In: AQUATIC TOXICOLOGY 34, pp. 351 - 369. In: NETHERLANDS JOURNAL OF ZOOLOGY 45/3-4, pp. 386 - 401. In: ENVIRONMENTAL TOXICOLOGY AND CHEMISTRY 14/5, pp. 781 - 791. In: Biochemical Journal 311/3, pp. 951 - 957. In: JOURNAL FÜR ORNITHOLOGIE 135/1, pp. 101 - 105. In: ENVIRONMENTAL MONITORING AND ASSESSMENT 25, pp. 65 - 84. In: Oecologia 89, pp. 32 - 41. In: ENVIRONMENTAL BIOLOGY OF FISHES 35, pp. 283 - 290. In: ARCHIVES OF ENVIRONMENTAL CONTAMINATION AND TOXICOLOGY 20, pp. 132 - 137. In: COMPARATIVE BIOCHEMISTRY AND PHYSIOLOGY C-TOXICOLOGY & PHARMACOLOGY 94 C/2, pp. 373 - 379. In: Oecologia 79, pp. 60 - 65. In: JOURNAL OF ANIMAL PHYSIOLOGY AND ANIMAL NUTRITION - ZEITSCHRIFT FÜR TIERPHYSI 62/4, pp. 188 - 202. In: ARCHIVES OF ENVIRONMENTAL CONTAMINATION AND TOXICOLOGY 18, pp. 562 - 567. In: COMPARATIVE BIOCHEMISTRY AND PHYSIOLOGY C-TOXICOLOGY & PHARMACOLOGY 85, pp. 135 - 145. In: ARCHIVES OF ENVIRONMENTAL CONTAMINATION AND TOXICOLOGY 18, pp. 554 - 561. In: COMPARATIVE BIOCHEMISTRY AND PHYSIOLOGY C-TOXICOLOGY & PHARMACOLOGY 92 C/2, pp. 355 - 360. In: CELL BIOLOGY AND TOXICOLOGY 4/1, pp. 97 - 101. In: CELL BIOLOGY AND TOXICOLOGY 4/1, pp. 81 - 96. In: Oecologia 67, pp. 82 - 89. In: Mikroskopie 42, pp. 88 - 93. In: COMPARATIVE BIOCHEMISTRY AND PHYSIOLOGY C-TOXICOLOGY & PHARMACOLOGY 79 C/1, pp. 125 - 129. In: COMPARATIVE BIOCHEMISTRY AND PHYSIOLOGY C-TOXICOLOGY & PHARMACOLOGY 79 C/1, pp. 117 - 124. In: Oecologia 30/3, pp. 253 - 264. In: Oecologia 30/3, pp. 265 - 272. In: Umweltwissenschaften und Schadstoff-Forschung 19/Sonderausgabe 1, pp. 35 - 42. In: REVIEWS OF ENVIRONMENTAL CONTAMINATION AND TOXICOLOGY 164, pp. 93 - 147. In: COMPARATIVE BIOCHEMISTRY AND PHYSIOLOGY C-TOXICOLOGY & PHARMACOLOGY 113 C/2, pp. 125 - 133. In: APPLIED BIOCHEMISTRY AND BIOTECHNOLOGY 48, pp. 27 - 31. In: Science of the Total Environment Suppl. Part I, pp. 607 - 615. In: Oecologia 73, pp. 91 - 98. In: NATURE 388/6639, pp. 237 - 238. In: COMPARATIVE BIOCHEMISTRY AND PHYSIOLOGY A-MOLECULAR AND INTEGRATIVE PHYSIOLOGY 154A/1 (Suppl. ), p. S33. In: COMPARATIVE BIOCHEMISTRY AND PHYSIOLOGY A-MOLECULAR AND INTEGRATIVE PHYSIOLOGY 154A/1 (Suppl. ), p. S5. In: COMPARATIVE BIOCHEMISTRY AND PHYSIOLOGY A-MOLECULAR AND INTEGRATIVE PHYSIOLOGY 154A/1 (Suppl. ), p. S24. In: COMPARATIVE BIOCHEMISTRY AND PHYSIOLOGY A-MOLECULAR AND INTEGRATIVE PHYSIOLOGY 154A/1 (Suppl. ), pp. S15 - S16. In: COMPARATIVE BIOCHEMISTRY AND PHYSIOLOGY A-MOLECULAR AND INTEGRATIVE PHYSIOLOGY 151A/1 (Suppl. ), p. 520. In: COMPARATIVE BIOCHEMISTRY AND PHYSIOLOGY A-MOLECULAR AND INTEGRATIVE PHYSIOLOGY 137 Supplement, p. 12. In: BONOTTO, S.; NOBILI, R.; REVOLTELLA, R.P. : Serono Symposia Review. Rom: Ares-Serono Symposia, Vol. 27, pp. 227 - 242. In: KLAASSEN; C.: Fourth Intern. Metallothionein Meeting. Basel - Boston - Berlin: Birkhäuser, pp. 173 - 178. In: VERNET. J.P.: 7th. Internat. Conference on Heavy Metals in the Environment. Edinburgh: CEP Consultants Ltd, pp. 554 - 557. In: VERNET. J.P.: 7th. Internat. Conference on Heavy Metals in the Environment. Edinburgh: CEP Consultants Ltd, pp. 550 - 553. In: VERNET. J.P.: 7th. Internat. Conference on Heavy Metals in the Environment. Edinburgh: CEP Consultants Ltd, pp. 358 - 361. In: BARKER, B.: Biology of terrestrial molluscs. Wallingford [u.a. ]: CAB International Publishing, pp. 489 - 525. In: EIJSACKERS, H.; HEIMBACH, F.; DONKER, M.: Ecotoxicology of soil pollution. Boca Raton: Lewis Publishers, pp. 347 - 357. In: DALLINGER, R.; RAINBOW, P.S. : Ecotoxicology of Metals in Invertebrates. Boca Raton: Lewis Publishers, pp. 291 - 313. In: DALLINGER, R.; RAINBOW, P.S. : Ecotoxicology of Metals in Invertebrates. Boca Raton: Lewis Publishers, pp. 245 - 289. In: DALLINGER, R.; RAINBOW, P.S. : Ecotoxicology of Metals in Invertebrates. Boca Raton: Lewis Publishers, pp. 315 - 332. In: DALLINGER, R.; RAINBOW, P.S. : Ecotoxicology of Metals in Invertebrates. Boca Raton: Lewis Publishers, pp. 119 - 131. Lecturer(s): DALLINGER, R.: Gastropod species as model organisms in ecotoxicology ? Introducing the molecular view. World Congress of Malacology 2007, Antwerp, 2007-07-17. Lecturer(s): Dallinger, Reinhard: Ecotoxicological Evaluation of new Bioremediation Options for Oil Spills in Seawater with Reference to the Italian Legislation. Lecturer(s): Dallinger, Reinhard: Metallothioneins as Biomarkers in Ecotoxicology: from basic research to application. 5. Wissenschaftliches Symposium der Österreichischen Gesellschaft für Toxikologie (ASTOX), Wien, 2008-11-19. Lecturer(s): DALLINGER, R. Co-author(s): EGG, M.; ATRIAN, S.: Molecular adaptation at different levels of biological organization: How terrestrial pulmonates solve their metal problem. 24th Annual Meeting of the European Society for Comparative Physiology and Biochemistry (ESCPB), Antwerp, 2006-09-19. Lecturer(s): DALLINGER, R.: Trace element handling in terrestrial invertebrates: the role of metallothioneins. Seventh National A.I.S.E.T.O.V. Congress, Chieti, 2002-09-27. Lecturer(s): DALLINGER, R.: Metal tolerance and metabolism in terrestrial invertebrates: molecular and biochemical aspects. 21th Congress of ESCPB, Liege, 2000-07-26. Lecturer(s): Höckner, M. Co-author(s): Schauer, K.; Drechsel, V.; Srut, M.; Dallinger, R.; Stürzenbaum, S.: Stress induced Metallothionein transcription and regulation in earthworms. Lecturer(s): Höckner, M. Co-author(s): Dallinger, R.; Stürzenbaum, S.: Studying MT regulation in L. rubellus, the red earthworm, suggests novel activation mechanisms. Lecturer(s): Atrian, Silvia Co-author(s): Pagani, Ayleen; Capdevila, Mercé; Palacios, Oscar; Egg, Margit; Höckner, Margit; Dallinger, Reinhard: Evolutionary diversification of snail metallothioneins is driven by extreme metal specificity of isoforms combined with cell-specific expression. Lecturer(s): HISPARD, F.; SCHULER, D.; de VAUFLEURY, A.; DALLINGER, R.: Metal speciation and metallothionein induction after cadmium exposure in the terrestrial snail Helix aspersa (Gastropoda, Pulmonata). Lecturer(s): DALLINGER, R.; MERANER, A.; THALER, R.; BRANDSTÄTTER, A.; ARAY, B.; UNTERLECHNER, M.; NIEDERSTÄTTER, H.; ZELGER, R.; PARSON, W.; DALLA VIA, J.: Molecular phylogeny and population structure of the codling moth (Cydia pomonella) in Central Europe: ancient distribution patterns and recent strategies of niche partitioning. Lecturer(s): DALLINGER, R.; EGG, M.; CAPDEVILA, M.; ATRIAN, S: How to cope with metal stress in a changeful environment - Lessons learned from terrestrial pulmonate mulluscs. 3rd Annual Meeting of the Center of Molecular Biosciences (CMBI), Vill, 2006-09-30. Lecturer(s): EGG, M.; HÖCKNER, M.; DALLINGER, R.: Vom Protein zum Gen – das Biomarker-Potential der Metallothionein-Antwort in der Weinbergschnecke und dessen ökologische Relevanz. 10. SETAC GLB – Meeting, Basel, 2005-09-29. Lecturer(s): DALLINGER, R.: Cu-metallothionein expression and Cu regulation in pulmonate snails. 1st Annual Meeting of the Center for Molecular Biosciences (CMBI), Vill, 2004-10-02. Lecturer(s): Dallinger, Reinhard: Cu-metallothionein expresion and Cu regulation in pulmonate snails. Lecturer(s): DALLINGER, R.; BERGER, B.; LAGG, B.; CHABICOVSKY, M.: Cd-Metallothionein of terrestrial pulmonates as a suitable biomarker for environmental metal pollution: Evidence from combined field and laboratory studies. SETAC Europe 12th Annual Meeting, Wien, 2002-05-16. Lecturer(s): DALLINGER, R.; THALER, R.; MERANER, A.; ARAY, B.; ZELGER, R.; WOLF, M.; DALLA VIA, J.: Molecular methods for identifying genotype-specific differences in pesticide resistance of the codling moth (Cydia pomonella). 3. Symposium Phytomedizin und Pflanzenschutz im Gartenbau, Wien, 2001-09-19. Lecturer(s): DALLINGER, R.; ZELGER, R.; DALLA VIA, J.: Molekularbiologische Methoden zur Differenzierung genotyp-spezifischer Insektizid-Resistenz beim Apfelwickler (Cydia pomonella). 1. Tagung Zoologische und Botanische Forschung in Südtirol, Bozen, 2000-09-30. Lecturer(s): DALLINGER, R.; BERGER, B.; HUNZIKER, P.; KÄGI, J.H.R. : Specific metallothionein ifosorms in cadmium detoxification and copper metabolism of snails. IV International Metallothionein Meeting Kansas City, Kansas City, 1997-09-19. Lecturer(s): DALLINGER, R.: Ökologisches Risikopotential der Räumschneeentsorgung in Fließgewässer. 82. Sitzung des Fachausschusses für Abfallwirtschaft und Städtereinigung, Innsbruck, 2007-05-22. Lecturer(s): PEDRINI-MARTHA, Veronika; Kopp, Renate; Niederwanger, Michael; Dallinger, Reinhard: First steps in understanding transcriptional regulation of Metallothionein genes in terrestrial snails. 4th Life Science Meeting of Innsbruck Universities, Igls, 2012-09-27. 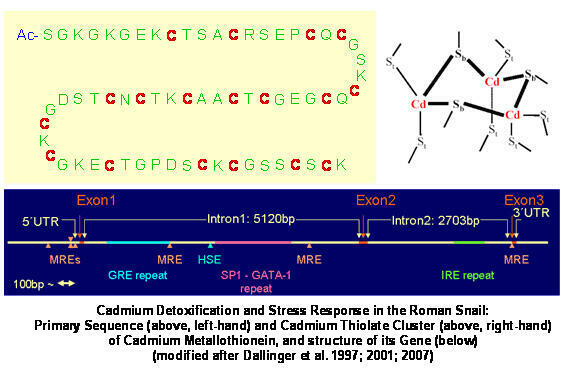 Lecturer(s): Dallinger, Reinhard; Höckner, Martina; Schuler, Dietmar; Egg, Margit; Atrian, Silvia; Capdevial, Mercé: Understanding multifunctionality of terrestrial gastropod Cadmium-Metallothioneins: High metal specificity of expressed protein is complemented by response plasticity at the gene level. Lecturer(s): Höckner, Martina; Schuler, Dietmar; Stefanon, Karin; Fantur, Rainer; de Vaufleury, Annette; Dallinger, Reinhard: A quantitative study based on Real-time detection PCR reveals specific expression patterns and metal-dependent upregulation of Metallothionein genes in the brown garden snail (Cantareus aspersus). Lecturer(s): Schuler, Dietmar; Höckner, Martina; Prader, Angelika; Dallinger, Reinhard: Biomphalaria glabrata embryonic cells as a model system for analysis of metal-induced stress and metal-dependent expression of invertebrate Metallothionein genes. Lecturer(s): Egg, Margit; Höckner, Martina; Brandstätter, Anita; Schuler, Dietmar; Dallinger, Reinhard: Plasticity in coping with multifarious Environmental Stress by Roman Snail Populations is linked to the structure and responsiveness of the Cd-Metallothionein Gene: a bioinformatic analysis. Lecturer(s): Stefanon, Karin; Höckner, Martina; Schuler, Dietmar; Fantur, Rainer; de Vaufleury, Annette; Dallinger, Reinhard: Metal-specific expression of Metallothionein isoform genes of the brown garden snail (Cornu aspersum): a quantitative study based on Real-Time detection PCR. Lecturer(s): ATRIAN, S.; CAPDEVILA, M.; PAGANI, A.; PALACIOS, O.; EGG, M.; DALLINGER, R.: Functional differentiation of metal-specific snail metallothionein (MT) native isoforms is confirmed by characterization of recombinantly synthesized metal-MT complexes. 4th Annual Meeting of the Center of Molecular Biosciences (CMBI), Igls, 2007-09-29. 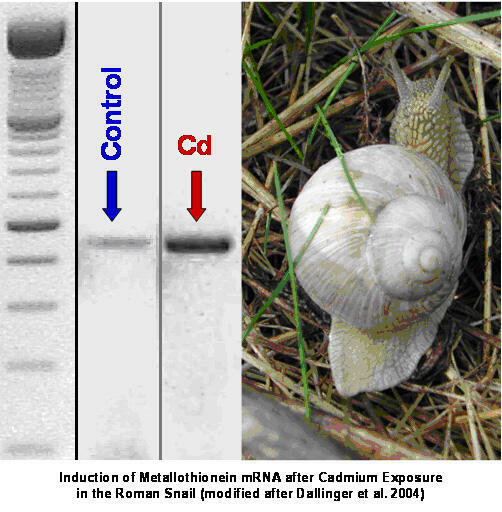 Lecturer(s): DALLINGER, R.; EGG, M.; HÖCKNER, M.; SCHULER, D.: The Cd-Metallothionein of the Roman snail Helix pomatia: Specific adaptation of a gene to cope with multifarious environmental stress. Lecturer(s): SCHULER, D.; HISPARD, F.; de VAUFLEURY, A.; DALLINGER, R.: Primary sequence and metal binding specificity of metallothionein isoforms in terrestrial snails: A key to understanding evolutionary and functional differentiation ? Lecturer(s): SCHULER, D.; EGG, M.; HISPARD, F.; de VAUFLEURY, A.; DALLINGER, R.: Characterization of Metallothionein isoforms in Cornu aspersum (Pulmonata) by a combined molecular and biochemical approach. Lecturer(s): Dallinger, R.; Egg, M.; Chabicovsky, M.: The dual metallothionein system of Helix pomatia: towards its application in environmental toxicology. Lecturer(s): EGG, M.; HÖCKNER, M.; DALLINGER, R.: The Cd-metallothionein gene of Helix pomatia: An evolutionary key to the understanding of complex stress response? Lecturer(s): Dallinger, R.; Egg, M.: Die Bedeutung ökotoxikologischer Grundlagenforschung für die Einschätzung und prognostische Beurteilung der Zustands- Entwicklung alpiner Lebensräume. Die Alpen im Jahr 2020. Erkenntnisse, Thesen, Szenarien, Fragen, Obergurgl, 2005-09-20. Lecturer(s): Dallinger, Reinhard; Hödl, Elisabeth; Chabicovsky, Monika: Quantitative relationship between Cd concentrations, cell-specific Cd-Metallothionein expression and cellular impairment in the midgut gland tissue of Helix pomatia. Lecturer(s): Egg, Margit; Höckner, Martina; Dallinger, Reinhard: Analysis of gene control regions of Cd- and Cu-metallothionein isoforms from Helix pomatia reveal remarkable structural features suggesting complex regulatory functions. Lecturer(s): Manzl, Claudia; Krumschnabel, Gerhard; Schwarzbaum, Pablo J.; Dallinger, Reinhard: In vitro toxicity of cadmium and copper to snail hepatopancreas cells. Lecturer(s): Manzl, Claudia; Berger, Christian; Krumschnabel, Gerhard; Dallinger, Reinhard: Hepatopancreas cells from Helix pomatia as a model system for toxicological studies: acute effects of copper and cadmium on energetics, ion homeostasis and cell structure. 11. Kongress über Alternativen zu Tierversuchen, Linz, 2003-09-19. Lecturer(s): Manzl, Claudia; Dallinger, Reinhard; Ebner, Hannes; Krumschnabel, Gerhard: Trout hepatocytes as a model system for the assessment of acute metal toxicity. Lecturer(s): Ebner, Hannes; Manzl, Claudia; Enrich, Julia; Dallinger, Reinhard; Krumschnabel, Gerhard: Copper-induced formation of reactive oxygen species causes a disruption of calcium homeostasis in trout hepatocytes. Lecturer(s): Krumschnabel, Gerhrad; Manzl, Claudia; Ebner, Hannes; Köck, Günter; Dallinger, Reinhard: Short-term effects of cadmium and copper on energetics and ion homeostasis in trout hepatocytes. Lecturer(s): Manzl, Claudia; Krumschnabel, Gerhard; Ebner, Hannes; Dallinger, Reinhard: Acute toxicity of copper and cadmium in hepatopancreas cells from Helix pomatia: effects on energetics, ion homeostasis and cell structure. Lecturer(s): Chabicovsky, Monika; Klepal, W.; Dallinger, Reinhard: Mechanisms of Cd toxicity in terrestrial pulmonates after short- and long-term exposure: programmed cell death and metallothionein overload. SETAC Europe 13th Annual Meeting, Hamburg, 2003-04-27. Lecturer(s): Ebner, Hannes; Manzl, Claudia; Koeck, Guenter; Dallinger, Reinard; Krumschnabel, Gerhard: Acute toxicity of cadmium and copper in trout hepatocytes. Lecturer(s): CHABICIVSKY, M.; DALLINGER, R.: Cd accumulation and in situ localisation of a Cd-inducible isoform in organs of the terrestrial gastropod Helix pomatia. SETAC Europe 12th Annual Meeting, Wien, 2002-05-14. Lecturer(s): KRUMSCHNABEL, G.; MANZL, M.; CHABICOVSKY, M.; DALLINGER, R.: pHi regulation in hepatopancreas cells from Helix pomatia: general characteristics and the impact of cadmium. Lecturer(s): Dallinger, Reinhard: Gastvorlesung "Bioindication and biomarker: molecular and physiological basics") im Rahmen des Lehrganges "Toxikologie". Medizinische Universität Wien, Wien, 2009-01-01 - 2009-12-31. Lecturer(s): DALLINGER, R.: Das Cadmium-Metallothionein der Weinbergschnecke: Ein ökologisch relevantes Stressprotein und seine genetische Regulation. Lecturer(s): DALLINGER, R.: Metal Regulation and Detoxification in Terrestrial Pulmonates: Molecular Adaptation at Different Levels of Biological Organization. Lecturer(s): DALLINGER, R.: Molecular Adaptation at different Levels of Biological Organization: How Terrestrial Pulmonates solve their Metal Problem. Universitat de Barcelona / Universität Barcelona, Barcelona, 2007-04-13. Lecturer(s): Dallinger, Reinhard: Gastvorlesung "Grundlagen der ökologischen Magnifikation und Bioindikation" im Rahmen des Lehrganges "Toxikologie. Medizinische Universität Wien, Wien, 2006-01-01 - 2006-12-31. Lecturer(s): Dallinger, R.; Chabicovsky, M.; Egg, M.: Cu regulation by subcellular speciation: Metal compartmentalization and the role of Cu- Metallothionein in a terrestrial snail. Lecturer(s): Egg, M.; Höckner, M.; Dallinger, R.: The Cd-Metallothionein gene of Helix pomatia: a prime example for gene functioning? Lecturer(s): DALLINGER, R.: Von resistenten Schlammröhrenwürmern und Apfelwicklern: Perspektiven und Chancen molekularer Methoden in der angewandten Forschung. Land- und Forstwirtschaftliches Versuchszentrum Laimburg, Auer (Ora), Südtirol, 2000-12-07. DALLINGER, R.: Co-Organization, member of Scienctific Committee, 25th Congress of the New European Society of Comparative Biochemistry and Physiology, Ravenna, Italien, 2008-09-07 - 2008-09-11. DALLINGER, R.: 13th Annual Meeting of SETAC Europe, SETAC Europe 13th Annual Meeting, Hamburg, Deutschland, 2003-04-27 - 2003-05-01. DALLINGER, R.: Challenges in Environmental Risk Assessment and Modelling - Linking Basic and Applied Research, SETAC Europe 12th Annual Meeting, Wien, Österreich, 2002-05-12 - 2002-05-16. DALLINGER, R.: Mitglied des Organization Committee und Mit-Organisation des 12th Annual Meeting der SETAC Europe, Wien, SETAC Europe 12th Annual Meeting, Wien, Österreich, 2002-05-12 - 2002-05-16. DALLINGER, R.: Mit-Organisation der 92. DZG-Tagung in Innsbruck, 92th Annual Meeting of the German Zoological Society (DZG), Innsbruck, Österreich, 1999-05-24 - 1999-05-27. Leopold-Franzens-Universität Innsbruck - Fakultät für Biologie, Innsbruck, 2012-02-01 - 2013-02-28. New European Society for Comparative Physiology and Biochemistry, Brüssel, 2010-09-09 - 2011-09-09. Israel Science Foundation (ISF), Jerusalem, 2010-04-14 - 2010-05-09. Water Research, Oxford, 2010-03-01 - 2010-12-31. Autonome Provinz Bozen-Südtirol - Landesregierung, Bozen, 2010-01-01 - 2012-12-31. Science of the Total Environment, 2010-01-01 - 2010-12-31. Molecular Ecology, 2010-01-01 - 2010-12-31. Journal of Arachnology, 2010-01-01 - 2010-12-31. Deutsche Bundesstiftung Umwelt (DBU), Osnabrück, 2009-02-24 - 2009-03-20. Journal of Proteome Research, 2009-01-01 - 2009-12-31. Archives of Environmental Contamination and Toxicology, New York, 2008-01-01 - 2010-12-31. Chemistry & Ecology, Abingdon, 2008-01-01 - 2008-12-31. Bulletin of Entomological Research, 2008-01-01 - 2008-12-31. Environmental Entomology, Lanham, MD, 2008-01-01 - 2008-12-31. Toxicological Sciences, Oxford, 2008-01-01 - 2008-12-31. Proceedings of the 7th International Symposium on Terrestrial Isopod Biology, 2008-01-01 - 2008-12-31. Biomarkers, London, 2008-01-01 - 2008-12-31. Molecular Ecology Resources, Hoboken, NJ, 2008-01-01 - 2008-12-31. Medizinische Universität Wien, Wien, 2007-11-01 - 2007-12-31. Israel Science Foundation (ISF), Jerusalem, 2007-05-01. Biotechnology and Biological Sciences Research Council (BBSRC), Swindon, 2007-03-12. Leopold-Franzens-Universität Innsbruck - Fakultät für Biologie, Innsbruck, 2007-01-01 - 2007-12-31. Biotechnology and Biological Sciences Research Council (BBSRC), Swindon, 2006-08-21. Natural Environment Research Council (NERC), London, 2006-04-07. Comparative Biochemistry and Physiology, Part A, Amsterdam, 2006-01-01 - 2010-12-31. Aquatic Toxicology, Amsterdam, 2006-01-01 - 2010-12-31. Ecotoxicology, New York, 2006-01-01 - 2010-12-31. Cell Biology and Toxicology, 2006-01-01 - 2008-12-31. Environmental Research, 2006-01-01 - 2008-12-31. FEBS Journal, 2006-01-01 - 2008-12-31. Belgian Journal of Zoology, Antwerpen, 2006-01-01 - 2008-12-31. Science of the Total Environment, 2006-01-01 - 2007-12-31. Limnology and Oceanography, 2006-01-01 - 2007-12-31. Environmental Pollution, 2006-01-01 - 2007-12-31. Environmental Toxicology, New York, 2006-01-01 - 2007-12-31. Environment International, 2006-01-01 - 2007-12-31. Ecotoxicology and Environmental Safety, Amsterdam, 2006-01-01 - 2007-12-31. Acta Ichthyologica et Piscatoria, 2006-01-01 - 2007-12-31. Archives of Biochemistry and Biophysics, 2006-01-01 - 2007-12-31. Leopold-Franzens-Universität Innsbruck - Fakultät für Biologie, Innsbruck, 2006-01-01 - 2006-12-31. Österreichischer Austauschdienst (OeAD) / Austrian Agency for International Cooperation in Education and Research, Wien, 2003-11-03. Österreichische Akademie der Wissenschaften – Doktorandenprogramm, 2003-09-08. Université de Franche-Comté, Besançon, 2003-01-01 - 2003-12-31. Universiteit Antwerpen / Universität Antwerpen, Antwerpen, 2002-10-21. Universiteit Antwerpen / Universität Antwerpen, Antwerpen, 2001-09-23. Leopold-Franzens-Universität Innsbruck - Fakultät für Biologie, Innsbruck, 2001-01-01 - 2001-12-31. Universität Wien, Wien, 2001-01-01 - 2001-04-30. Natural Environment Research Council (NERC), London, 2000-12-11. European Science Foundation (ESF), Strasbourg Cedex, 2000-04-27. Bundesministerium für Bildung und Forschung, Bonn, 2000-01-10. Nederlandse Organisatie voor Wetenschappelijk Onderzoek / The Netherlands Organisation for Scientific Research (NWO), Den Haag, 1999-11-15. Leopold-Franzens-Universität Innsbruck, Innsbruck, 1999-05-01 - 1999-12-31. Jubiläumsfonds der Österreichischen Nationalbank (OeNB), Wien, 1999-04-29. Fonds Wetenschappelijk Onderzoek (FWO) / Research Foundation Flanders, Brüssel, 1998-02-25. Life Sciences Foundation, Den Haag, 1997-10-17. Eberhard-Karls-Universität Tübingen, Tübingen, 1997-01-01 - 1997-10-31.